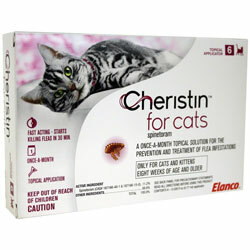 Cheristin for Cats is a monthly topical solution that treats and prevents flea infestations on cats. This simple solution comes in simple doses with an easy to use applicator. Using the active ingredient spinetoram, this medication starts killing fleas within 30 minutes of its initial application to end infestations fast. Cheristin for Cats also protects cats for a full 30 days with each application. This box contains 6 doses of the medication to keep your cat safe and healthy. Whether you're looking to eliminate an infestation or hoping to avoid one entirely, grab a box of Cheristin to keep your cat flea-free today! More detailed directions for use are included in the box. Read the entire label, directions for use and frequency of application each time before using this product. For prevention and treatment of fleas, part the hair on the neck at the base of the head and apply the contents of the applicator tube to a single spot on the skin of the cat. Do not apply on the surface of the cat's hair coat. Place the empty applicator tube in the trash. Monthly application is recommended to prevent and treat flea infestations. Cheristin for cats starts working in 30 minutes and continues killing fleas for a full month after application. HAZARDS TO DOMESTIC ANIMALS: FOR USE ON CATS AND KITTENS ONLY. For external use only. Do not use on kittens less than eight (8) weeks of age or weighing less than 1.8 lb. Do not allow your cat to ingest this product. Use only a single dose on cats weighing greater than 20 lbs. As with any product, consult your veterinarian before using this product on debilitated, aged, pregnant or nursing animals known to be sensitive to pesticides. Hold eye open and rinse slowly and gently with water for 15 - 20 minutes. Remove contact lenses, if present, after the first 5 minutes, then continue rinsing. Call a poison control center or doctor immediately for treatment advice.  Have the product label with you when you call the poison control center or medical professional. Have person sip glass of water if able to swallow. Do not induce vomiting unless told by a poison control center or doctor. Have the product container or label with you when calling a poison control center or doctor or going for treatment. You may also contact Rocky Mountain Poison Control at 1-888-767-5023 for emergency medical treatment information. Side Effects: Monitor your cat after application. Side effects may include signs of application site reactions such as application site hair loss, hair change (greasy, clumping or matting) or redness, inflammation, and itching. Other side effects such as inactivity, vomiting and inappetance have also been reported. If these or any other side effects occur, consult your veterinarian, your cat's healthcare expert. For technical assistance or to report a side effect, call Elanco at 1-888-545-5972. Harmful if swallowed. Causes moderate eye irritation. Wash thoroughly with soap and water after handling and before eating, drinking, chewing gum, using tobacco or using the toilet. Avoid contact with eyes or clothing. FOR USE ON CATS AND KITTENS ONLY. For external use only. Do not use on kittens less than eight (8) weeks of age or weighing less than 1.8 lb. Do not allow your cat to ingest this product. Use only a single dose on cats weighing greater than 20 lbs. As with any product, consult your veterinarian before using this product on debilitated, aged, pregnant or nursing animals or animals known to be sensitive to pesticides. Monitor your cat after application. Side effects may include signs of application site reactions such as application site hair loss, hair change (greasy, clumping or matting) or redness, inflammation and itching. Other side effects such as inactivity, vomiting and inappetance have also been reported. If these or any other side effects occur, consult your veterinarian, your cat’s healthcare expert. For technical assistance or to report a side effect, call Elanco at 1-888-545-5973. • Hold eye open and rinse slowly and gently with water for 15-20 minutes. Remove contact lenses, if present, after the first 5 minutes, then continue rinsing. 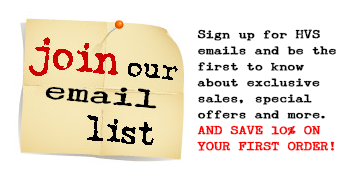 • Call a poison control center or doctor for treatment advice. • Call a poison control center or doctor immediately for treatment advice. Have the product label with you when you call the poison control center or medical professional. • Have person sip a glass of water if able to swallow. • Do not induce vomiting unless told to by a poison control center or doctor. • Do not give anything to an unconscious person. Read the entire label, directions for use and frequency of application each time before using this product. For external use on cats and kittens only. 1. Use only on cats and kittens 8 weeks of age and older and weighing 1.8 lbs or more. Do not use more than a single dose on cats weighing greater than 20 lbs. 2. Remove one applicator tube from the blister package. 3. Hold applicator tube in an upright position. 4. Press cap down until it clicks (indicating the tube has been punctured). Hold upright and remove cap. Check to be sure there is an opening at the tip of tube. 6. Discard empty applicator tube in the trash. Store in original package in a cool dry place. Call your local solid waste agency or 1-800-CLEANUP or equivalent organization for disposal instructions. Unless otherwise instructed place in trash. Never pour unused product down the drain or on the ground. If empty: Non-refillable container. Do not reuse this container. Place in the trash, or offer for recycling if available. By using, buying or handling this product, users or buyers accept the following conditions, disclaimer of warranties and limitations of liability. The directions for use of this product are believed to be adequate and must be followed carefully. All risks of product use or handling are assumed by the user or buyer. No agent of Elanco is authorized to make, extend or modify any warranties. TO THE EXTENT CONSISTENT WITH APPLICABLE LAW ELANCO MAKES NO OTHER WARRANTIES, EXPRESSED OR IMPLIED, OF MERCHANTABILITY OR OF FITNESS FOR A PARTICULAR PURPOSE OR OTHERWISE, THAT EXTEND BEYOND THE STATEMENTS MADE ON THE LABEL. ELANCO DISCLAIMS ANY LIABILITY WHATSOEVER FOR SPECIAL, INCIDENTAL OR CONSEQUENTIAL DAMAGES RESULTING FROM THE USE OR HANDLING OF THIS PRODUCT. To the extent consistent with applicable law the exclusive remedy of the user or buyer for any and all losses, injuries or damages resulting from the use or handling of this product, whether in contract, warranty, tort, negligence, strict liability or otherwise, is limited to the purchase price paid or replacement of the product. Cheristin is a trademark owned or licensed by Eli Lilly and Company, its subsidiaries or affiliates.